Australian Baby Boomers are splashing out millions of dollars on cruising – and spending their children’s inheritance on it, according to one survey – but if anyone thinks all cruises are plain sailing, a few recent surprises and weird events suggest otherwise. 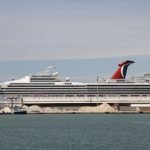 When a sudden tilt – or list, in nautical speak – hit the ship Carnival Sunshine and tipped the ship to one side, it sent plates and other loose items crashing to the floor. Passenger reports say the sudden tilt caused alarm and panic, with some elderly passengers thinking the ship was sinking. “Everybody thought we were sinking. The ship is sideways. What do you think if there’s water pouring in? – but it was from the pool,” one shaken passenger said. Newsweek related how Navigator of the Seas docked at the Port of Vigo, Spain, after a “Bravo Code” fire announcement relating to one of ship’s stabilisers. A source cited by Newsweek said: “One of the stabilisers on the Navigator of the Seas broke and made a hole at the hull, they had to close an entire fire zone because it was leaking water like crazy. Passenger Paul Edwards told The Express newspaper: “We were experiencing rough sea last night, and then in the early hours last night we heard a bang. 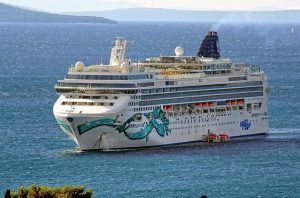 In yet another mechanical incident, Norwegian Cruise Line ended a 10-night cruise on its Miami-based ship Norwegian Jade after just two days this week when the vessel struck steering trouble. Norwegian flew passengers back to the US from Puerto Rico, where the 2400-passenger vessel is stuck while its propulsion and steering system are repaired. Cruise lines are becoming adept at adjusting itineraries to avoid cyclones or hurricanes, but they can’t prevent everything. Occasionally someone jumps overboard and other weird incidents sometimes occur. Not long before, a 23-year-old American man was jailed for 10 years for sexually abusing an intellectually disabled woman during a cruise to the Bahamas on the Carnival ship Elation. 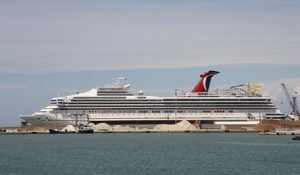 The man was found to have touched the woman underneath her bathing suit in a public hot tub during a cruise earlier this year. Most cruises go well, however and more than 750,000 Australians aged 50 and over took a cruise in 2017, accounting for 57% of the 1.34 million Australian cruise passengers. The average length of a cruise was 9.1 days. Analysis from finder.com.au of 300 cruise deals revealed that older cruisers (the Baby Boomer generation) spent an average of AUD 1467 per couple on a twin room, or more than AUD 556 million collectively on cruises in 2017. Based on the rise in senior cruisers, finder.com.au expects 1.4 million Baby Boomers to cruise in 2018. “Almost one in 10 Aussie Baby Boomers took a cruise holiday last year. This older demographic tends to prefer longer expeditions, sparing no expense on transatlantic or world cruises,” she said. A survey of nearly 6000 seniors found that conserving money to pass on to their children is no longer high priority, with many opting to spend their cash on travel instead. Destinations most popular with retirees include New Zealand, the Mediterranean, Asia, Northern Europe, Alaska, and Antarctica.